Students for Biological Sciences club members from Webster University toured the Saint Louis Zoo on Oct. 14. While many Webster University students were heading to fall break after finishing up Fall 1 finals, one group of students first took a special detour to delve further into their field. The Students for Biological Sciences (SBS) club toured the Saint Louis Zoo on Friday, Oct. 14, taking advantage of a rare opportunity to see what goes on behind the scenes, as well as learn about research the zoo is conducting and how it is being applied throughout the local region and the world. The SBS club aims to promote scientific learning and to establish an open educational community for all at Webster. They hope to foster scientific interests with engaging public discussions, student forums, guest lectures, and a myriad of interactive activities. “We normally have speakers come and tell us about what they do, but this time we wanted to go to them," Burke said. Even with a break from the busy fall schedule of courses and exams beckoning, it was time well spent. "This is something that the club really liked," Burke said. 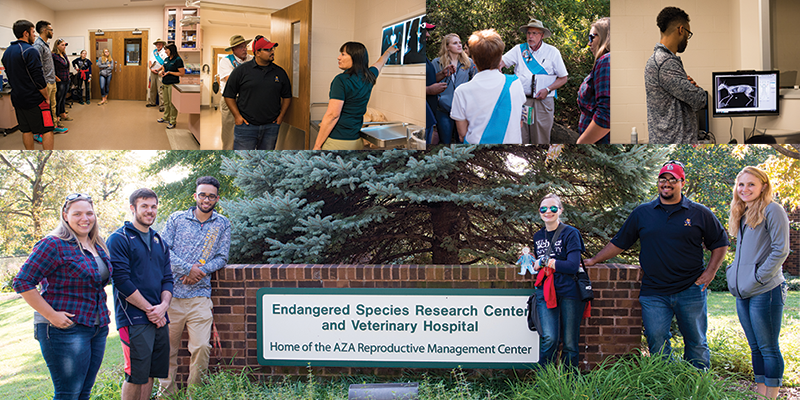 "We plan on taking what we did at the zoo and applying it to other places where people do not think about the science involved behind the scenes." Long one of the more popular undergraduate majors at Webster, Biological Sciences and related fields will get a boost with the opening of Webster's $44 million Interdisciplinary Science Building in fall 2017. Earlier this year, Webster University was awarded more than $1 million in grants from the National Institutes of Health (NIH) and the National Science Foundation (NSF) to support faculty research and to provide scholarships for students transferring to Webster in the Biological Sciences.